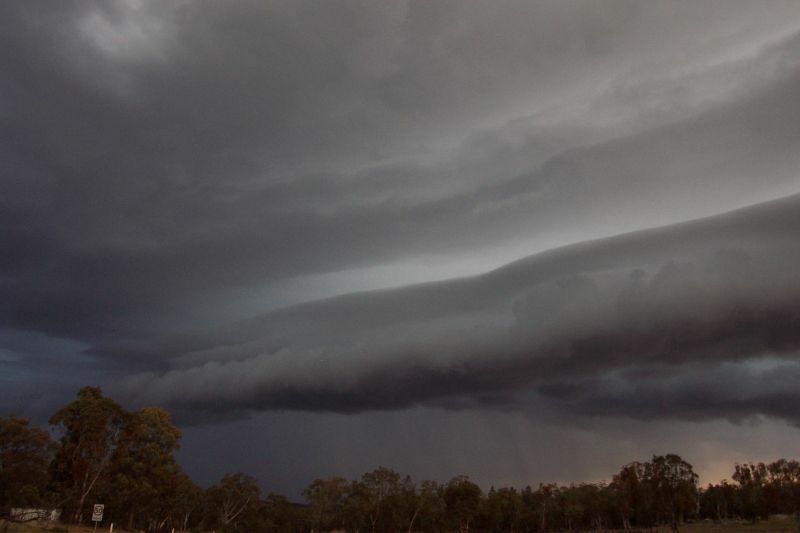 Thunder Down Under is a storm chasing holiday that a number of Australian storm chasers take part in during November and December each year. Some chasers go for a couple of days, others for a few weeks. 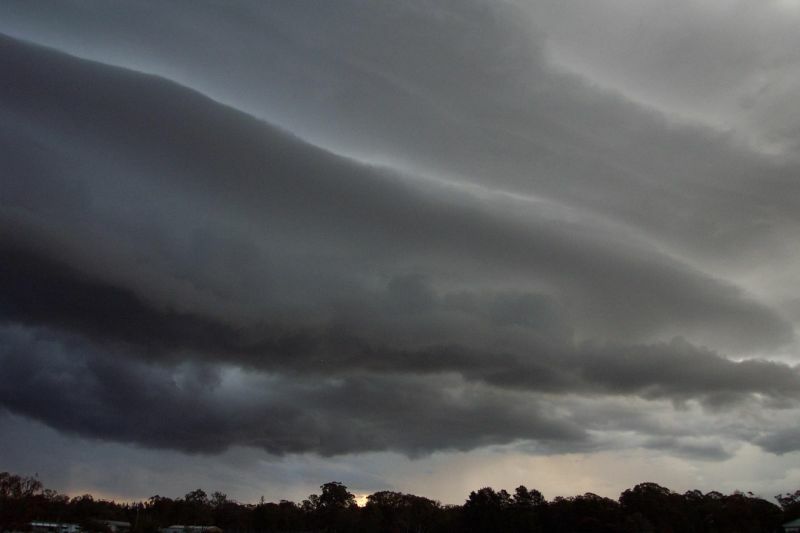 It certainly is a great experience to see parts of Australia as well as experiencing some of the best of Australia's storms. Unfortunately the 16th to the 23rd of November was almost stormless, and so we didn't see many storms at all. 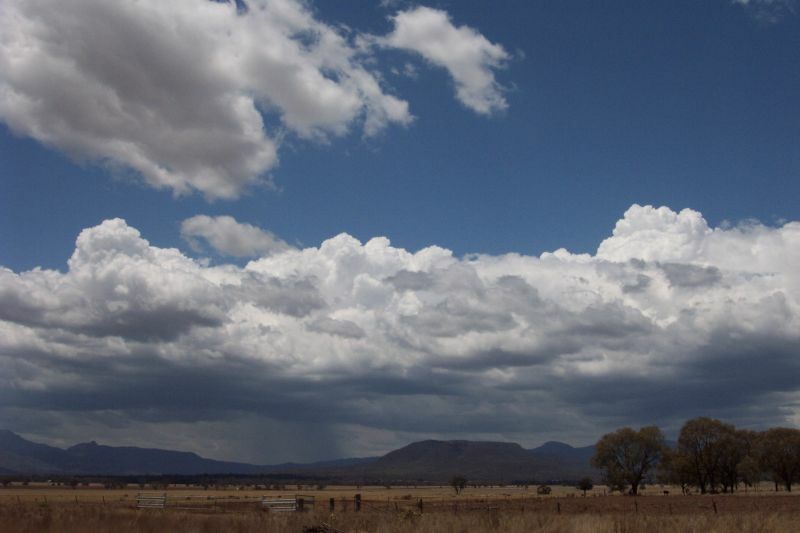 But we certainly saw plenty of exciting weather and experienced lots of the Australian landscape, which certainly made up for the lack of storms! Below is an account of our holiday, with all the images taken with my digital camera throughout the holiday. We departed Wollongbar around 7am. My brother and his wife decided to join me and dad for the first day of the trip. The sky was very discouraging, with a very strong SE blowing, drizzle, and 8/8 cloud cover when we left. After a week of storms before leaving, the SE winds were back, which was not good for storm chances. We headed for S QLD where AVN had forecast LIs down to -4 and CAPE around 800. We took a path from Wollongbar - South Brisbane - Toowoomba - Dalby. Throughout the trip we were met with SE winds and 8/8 cloud cover. It was quite cool. 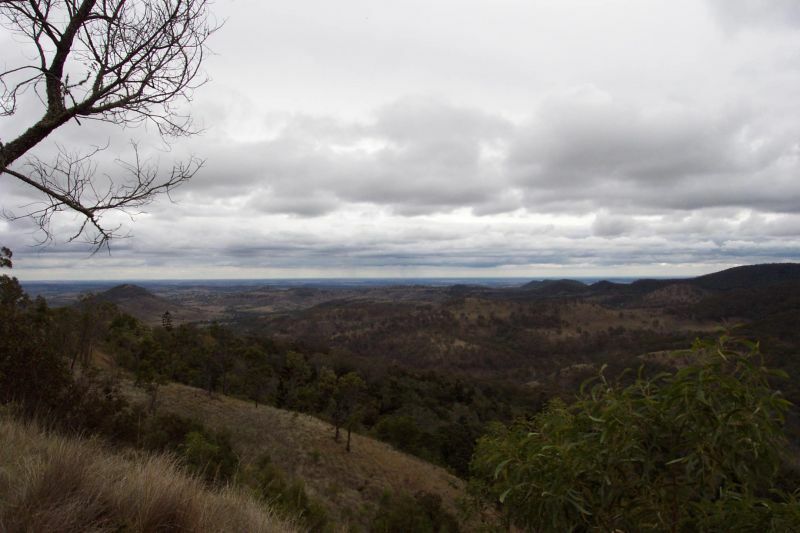 At Dalby I decided it wasn't worth heading any further north, as storms were unlikely in any area we could reach so we decided to do a bit of bushwalking. The view from near the top on the Bunyan Mountains was rather nice. On the way back down we got a message from Anthony Cornelius that tracker was picking up lightning in the Carnarvons. We could see the distant dark skies, but they were no good for us, as storms were too far away and heading in the wrong direction. Before getting dinner we drove just west of Dalby to get some sunset photos, which turned out quite nice. We hit the sack, and I was pretty disappointed as storms were not forecast in the NSW/QLD border region for the week ahead. 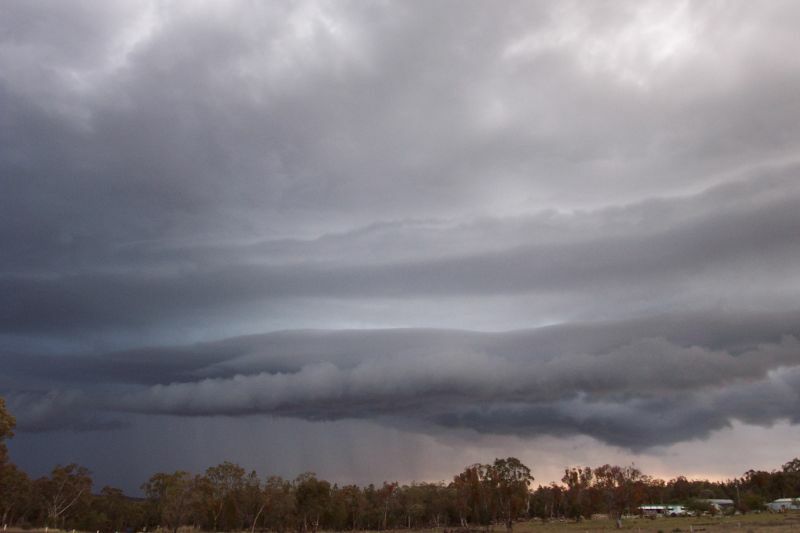 At around 9.30am we decided to head to Moree, as I'd never been there and we thought we could drop into the Bureau of Meteorology office there. My brother and his wife left us to head back home and we went on our way. There were a few distant very weak anvils to the NE that morning, but other than that the sky was very clear. 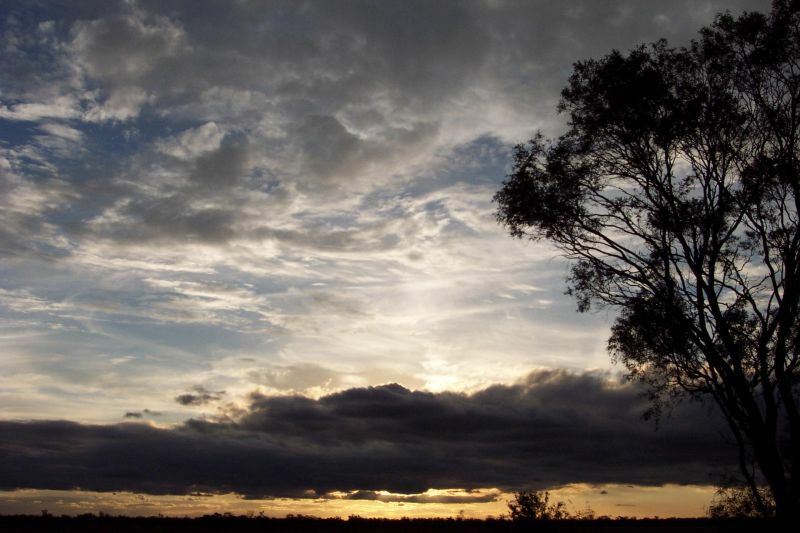 We travelled from Dalby - Moonie - Goondiwindi - Moree. The road was so straight with no traffic, and so it was quite an easy drive! When we got into Moree we headed to the BoM office. We originally followed the town's map which had it in the wrong place (where the office used to be before moving in 1995). We eventually found the office near the airport and called in. The local technical officer was doing some gardening but took some time out to show us how everything works and what his job is. It was a really interesting hour, checking all their equipment and learning quite a lot of stuff. 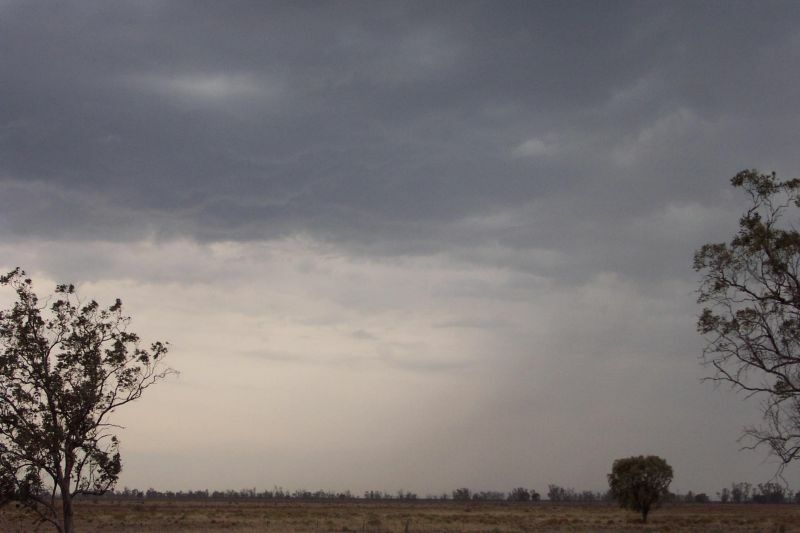 After hanging around the office watching him complete his obs we decided to head back into Moree and get an update about storm potential in NSW for the next few days. After some discussion with Michael Bath we decided to stay in Moree for the night and leave for Southern NSW around 4.30am. 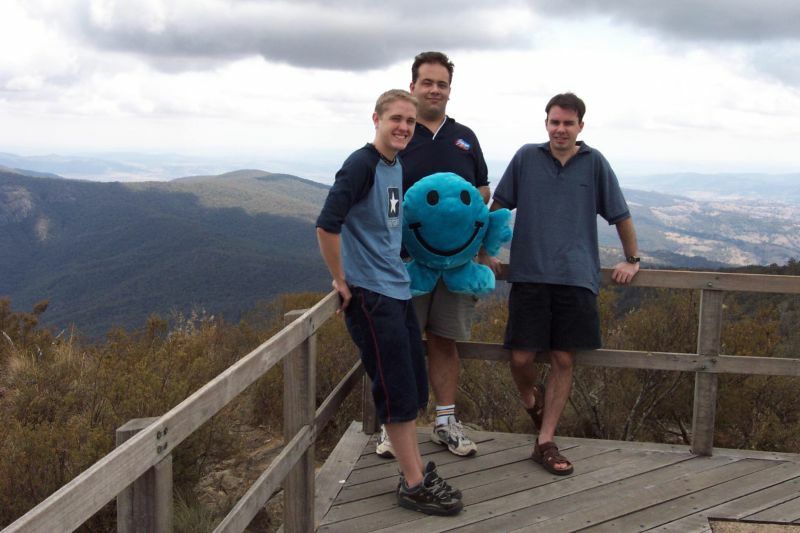 We aimed to reached Griffith by afternoon. It was quite an early start! We were up at 4am and left the caravan park by 4.30am. There were so many kangaroos sitting along the road, which was a bit of a concern if they decided to jump out in front! 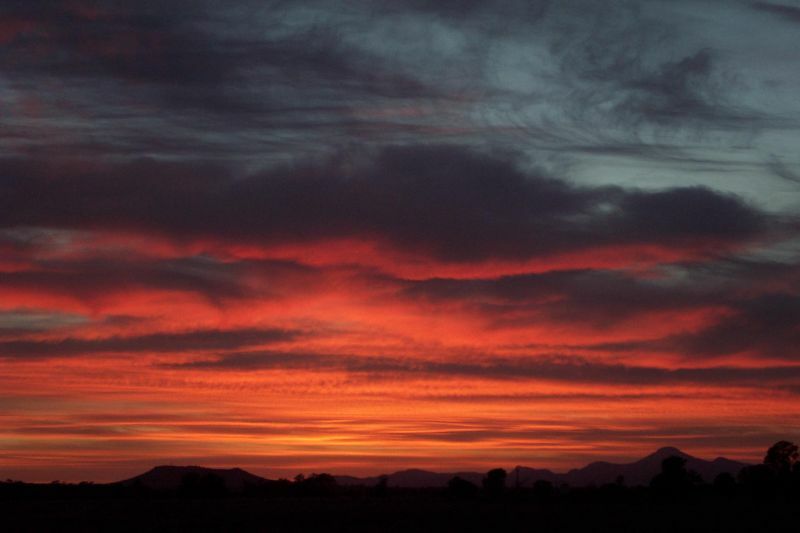 We were treated to a beautiful sunrise which kinda made up for the really early start! We travelled from Moree - Narrabri - Coonabarabran - Gilgandra (known as 'the home of windmills and coo-ees') - Parkes - West Wyalong - Griffith. 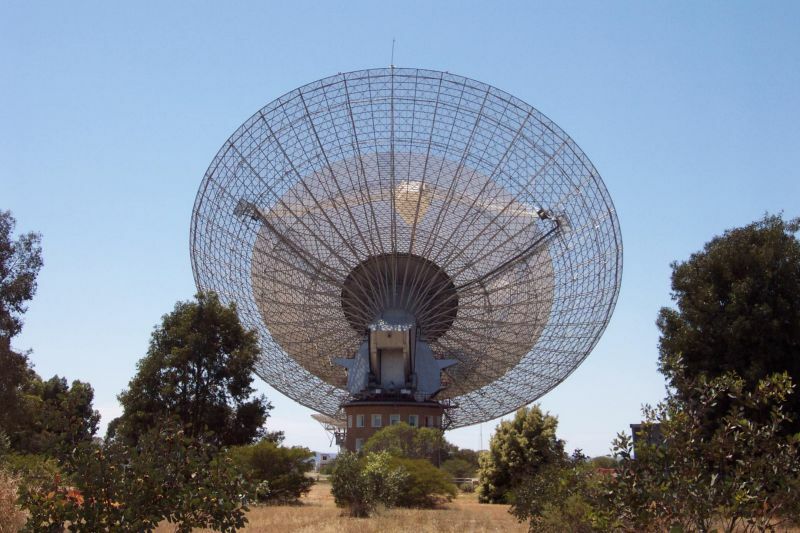 At Parkes we stopped to see 'the dish' which was pretty cool, but we weren't there for long as we still had a long way to travel! 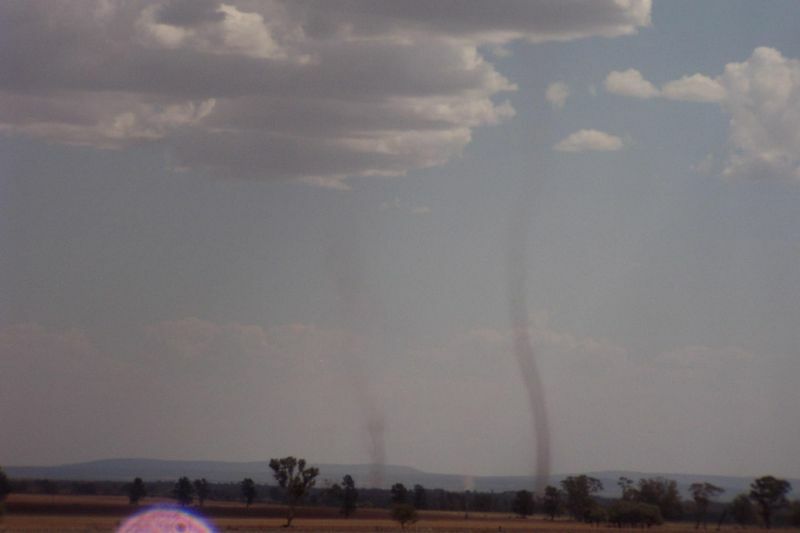 One exciting element of the day was all the dust devils we saw. 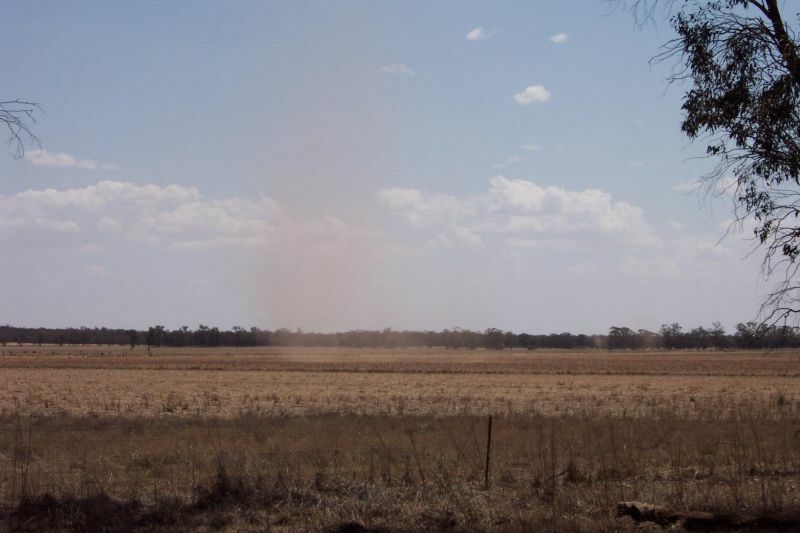 I had never seen a proper dust devil before, and conditions were perfect for them with clear skies allowing the very hot sun to heat the ground. 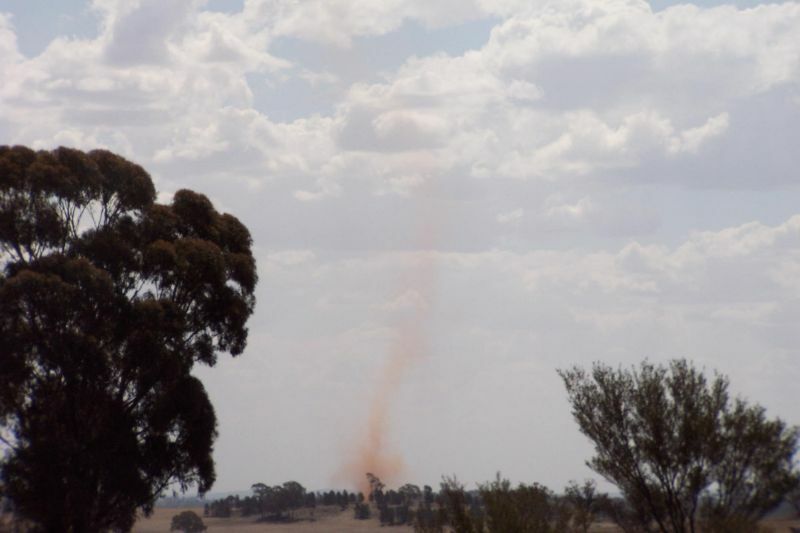 We even saw a dust devil form on water, so it was a water devil! As we got closer to Griffith later in the day we saw some of the best ones reaching up quite high! 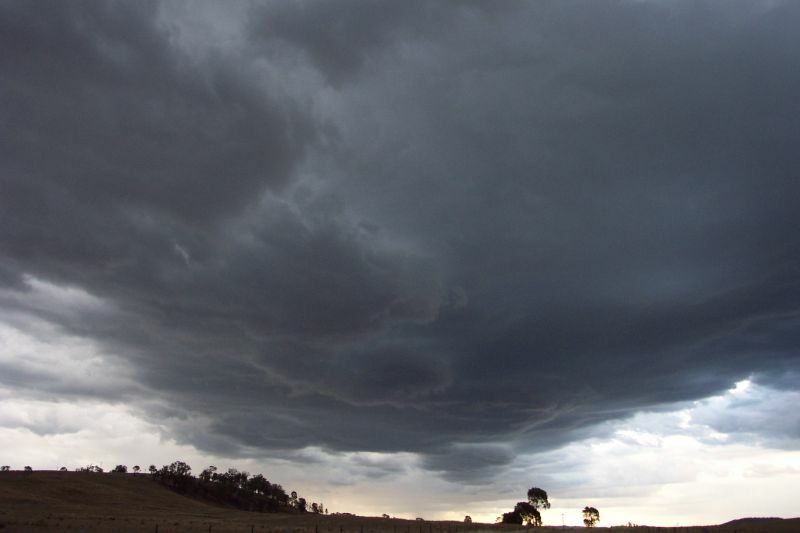 We booked in at Griffith and got an update that there were storms near the ACT and Deniliquin. 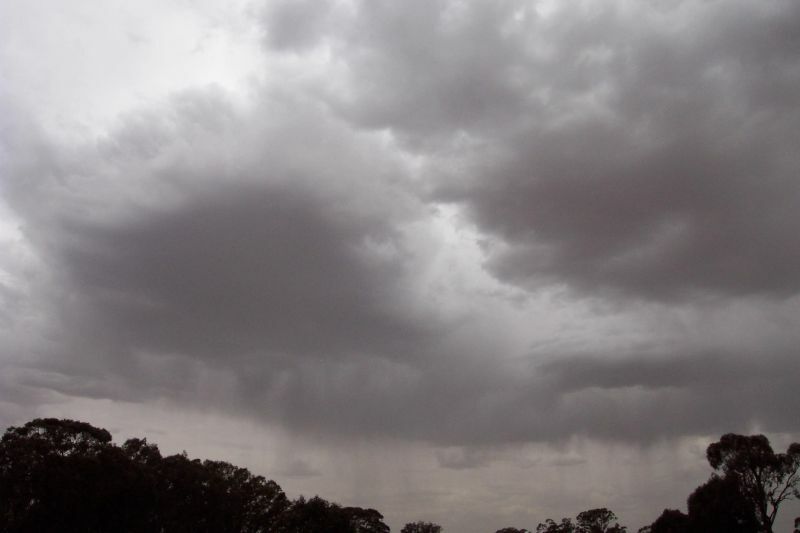 I could see the cell near Deniliquin, but it looked so weak that we basically ignored it! 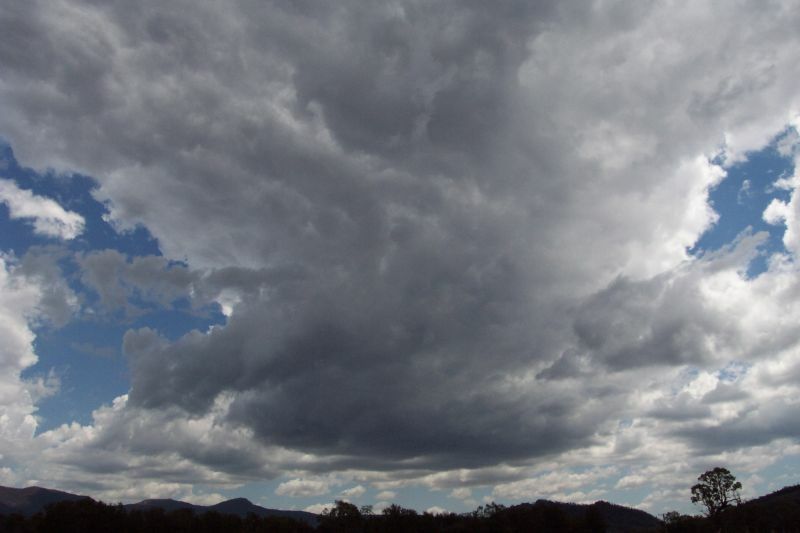 There was very little chance of storms, as the DP was 1C at one stage in the afternoon! Not good for storm development. After snapping a pic of the storm, we called it a night and planned to stay in the same area for the next day, which looked ok for storm development. After a welcomed sleep in after yesterdays early start we ventured into Griffith around 10.30am to check the models and decide which area to head to. 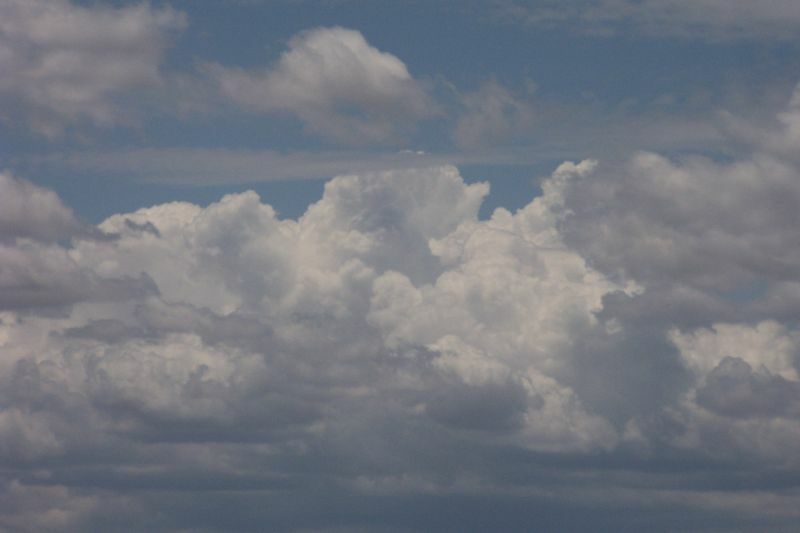 There was significant mid and high level cloud cover, and I was concerned moisture was still too low. Checking the models it seemed moisture was going to be the deciding factor for storms today, and it didn't seem good. There was VERY low moisture levels in the lower atmosphere, but plenty in the mid to upper atmosphere. We ended up heading to Wagga Wagga via Leeton which was quite a short drive compared to the day before. 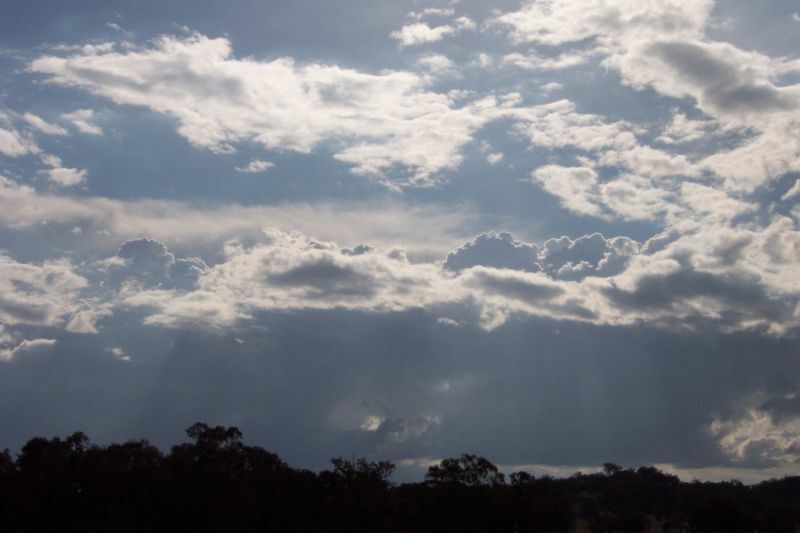 Between Leeton and Wagga some very high based showers developed. 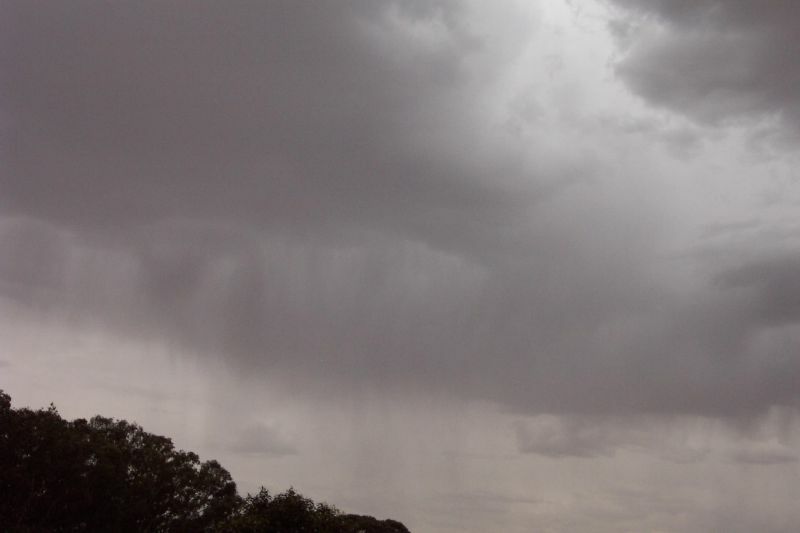 After a short time the sky was filled with virga, but a number of showers made it to the ground. We watched one for a little bit, as this was the most exciting thing we'd seen! It was pretty featureless however, but did kick up some very strong winds which were quite exciting! On top of this, the dry conditions meant that the winds whipped up a lot of dust, and we soon found ourselves in the middle of a dust storm. 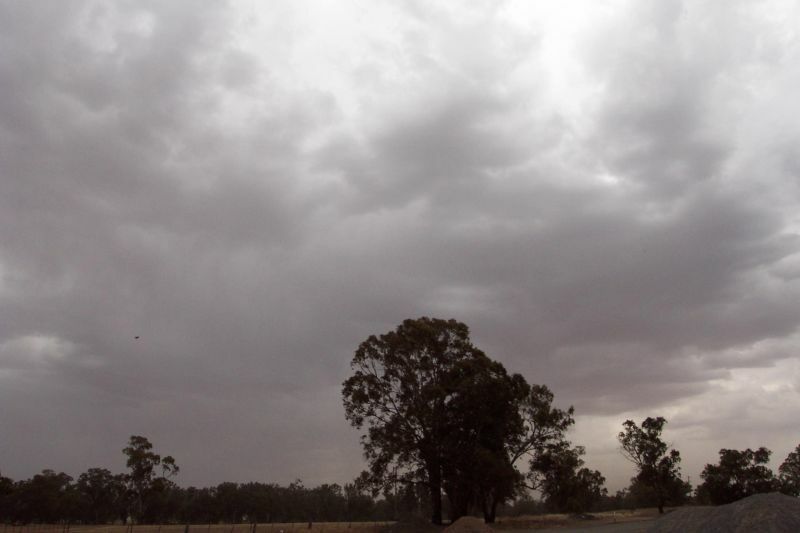 We continued on our way to Wagga, soon getting ahead of the showers and dust (no thunder was heard at all). 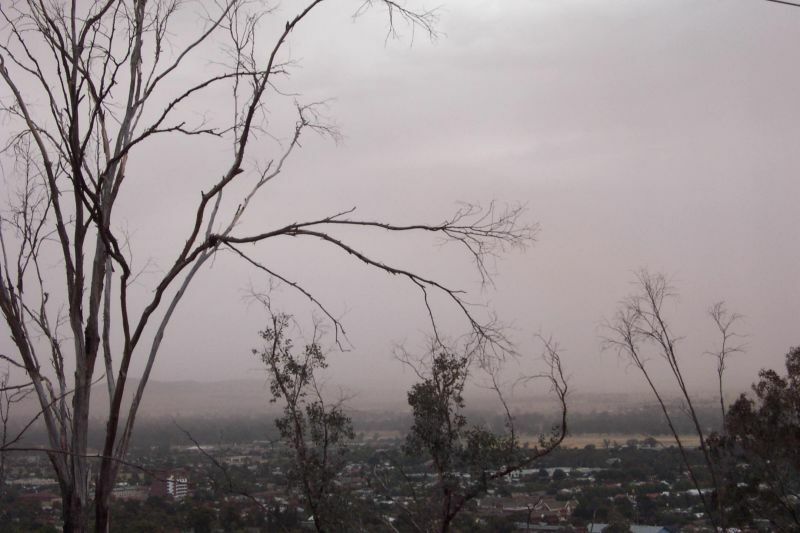 At Wagga we found a bit of a look out and watched the dust hit the town. It was quite warm and with the wind and dust it quickly became quite uncomfortable. We decided to book into a cabin. 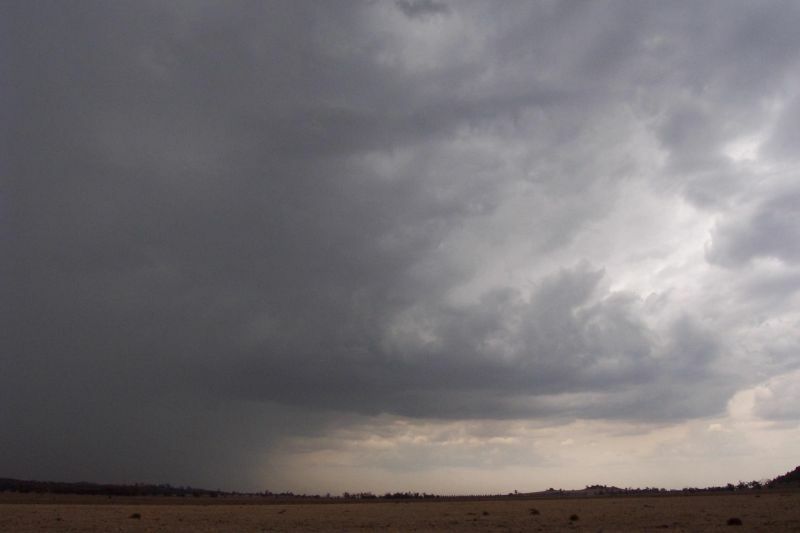 It was so dry still that we weren't very confident of any storm activity. We soon found out from Michael that there was some activity NW of us, but that wasn't any good for us, so once again we called it a day, still no storms. 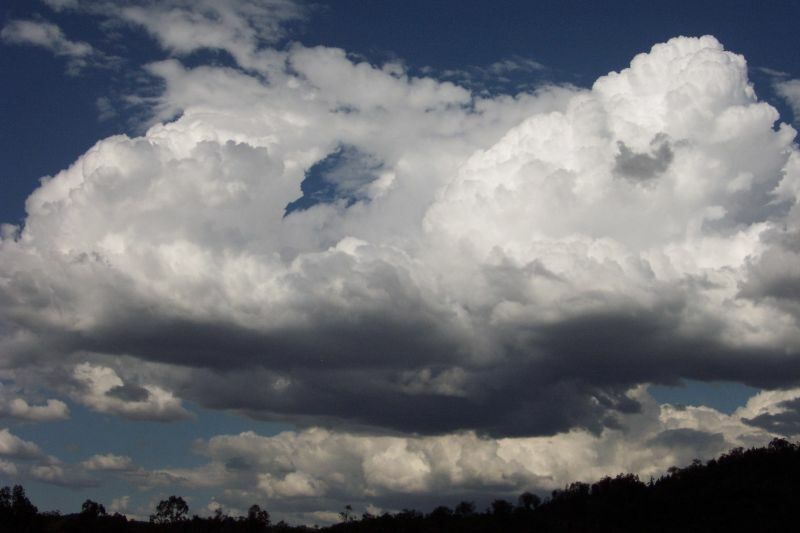 Once again the region we were in looked to be the best spot for storms in the state as far as instability goes, but moisture still was not good, and there was still almost 8/8 cloud cover stopping the sun's heating action. Realising we had to head north again at some stage, and that Anthony Cornelius and James Chambers were heading out today we decided to just head north and hope to see something on the way. 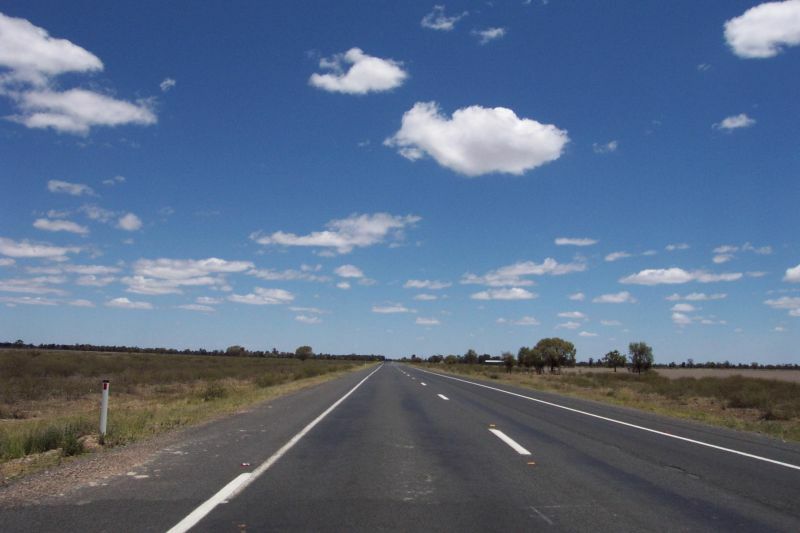 The trip included stops at Wagga - Junee - Blayney - Orange - Dubbo - Coonabarabran. Most of the way cloud cover was still 8/8 with almost no Cu around. 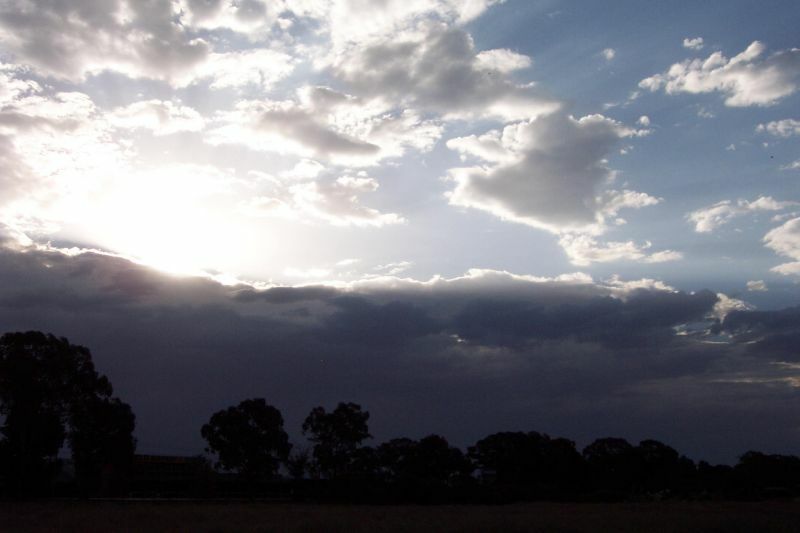 By Dubbo (originally our target for the day) the sky was almost clear of high level cloud and quite a bit of 'junky' Cu was around. It was quite hot, around 37C!! And the DP was in the low teens, not ideal for storms. 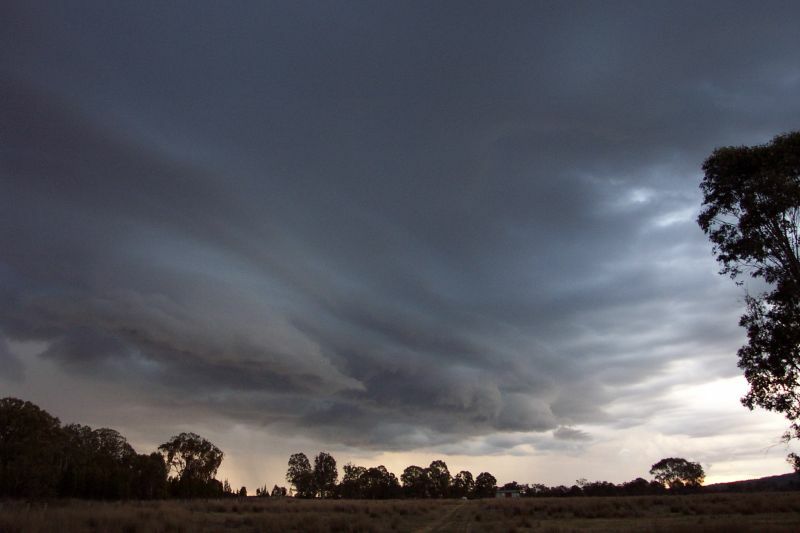 After checking models in the library at Dubbo we decided to head a little further north for the night to reach the target area and meet up with Anthony and James, who were chasing a weak cell near Tamworth. We were treated to a very nice sunset, but I didn't have my camera with me as we had gone out for dinner! Once again we awoke to almost completely overcast skies. Anthony called and we decided to meet up at Gunnedah, about an hours drive ENE from where we were. What was scary was that when we were travelling we experienced the driest, deadest land of the whole trip. It was just depressing, dead animals in the paddocks and no grass anywhere. 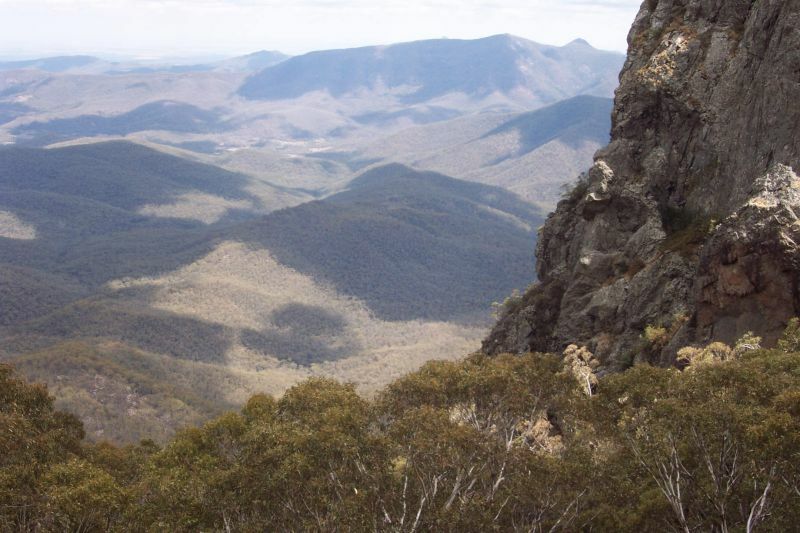 We met up at 10.30am at Maccas and went to Porcupine lookout, which had good views of the east and west. There was still 8/8 cloud cover and we sat around, playing a little bit of frisbee and throwing ice onto the roof till deciding to go get some lunch from town and check the net. There was only a tiny bit of flat Cu around. Sadly we couldn't get a PC at the library to use the net, so we had lunch and headed back to the lookout. When we got there the cloud had thinned out somewhat to the west and already Cjs started popping up over the ranges which had sunlight on them. 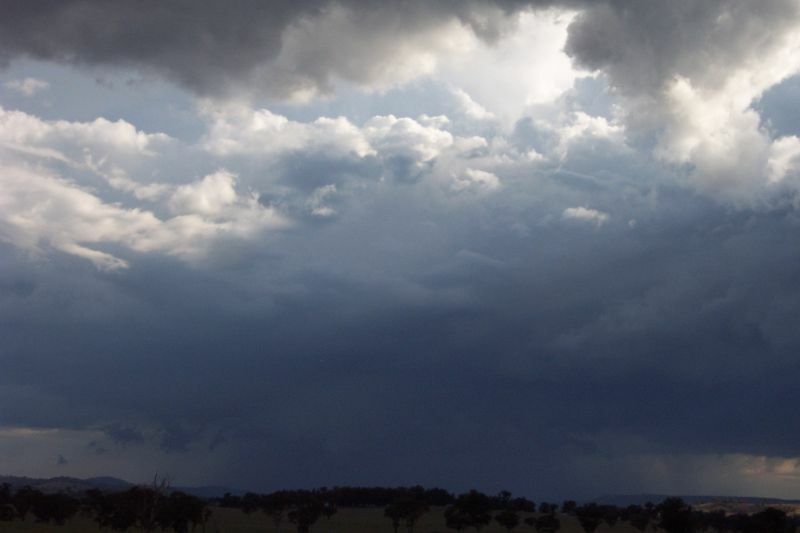 Soon after we decided to chase some alright looking congestus near Coonabarabran. We eventually found ourselves in the heavy rain under the cell, and soon enough CGs started punching around nearby, picked up on the CB radio as well. After some fun driving through the rain we headed back out of the cell and around to it's southern side to watch it. It was still producing the occasional CG with some nice thunder! We had finally gotten a real storm!!!! 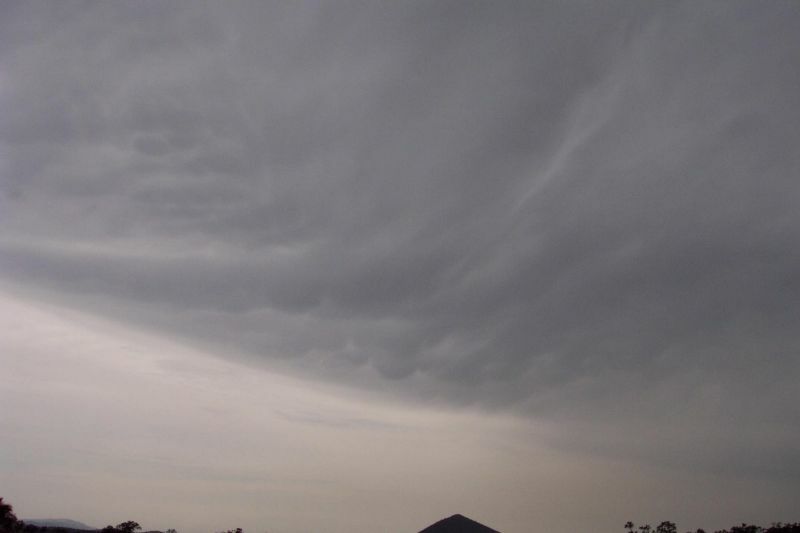 Weak cells were beginning to pop up around the place, and mammatus began to form overhead. 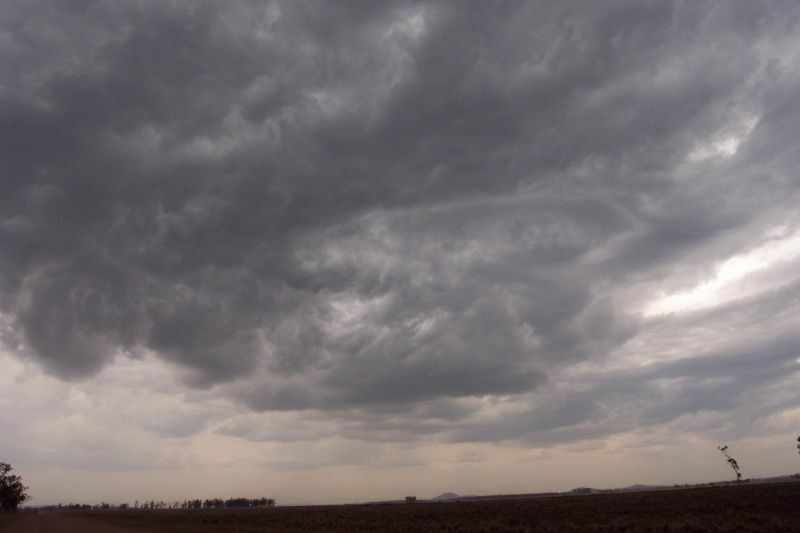 We headed north to keep ahead of the cells, encountering some strong gusts. After refuelling we headed north to Narrabri, and called it quits for the day. The activity south of us was really weak now. We grabbed some dinner from the bowling club and came back and watched Survivor (yay, they got rid of Erin!!). 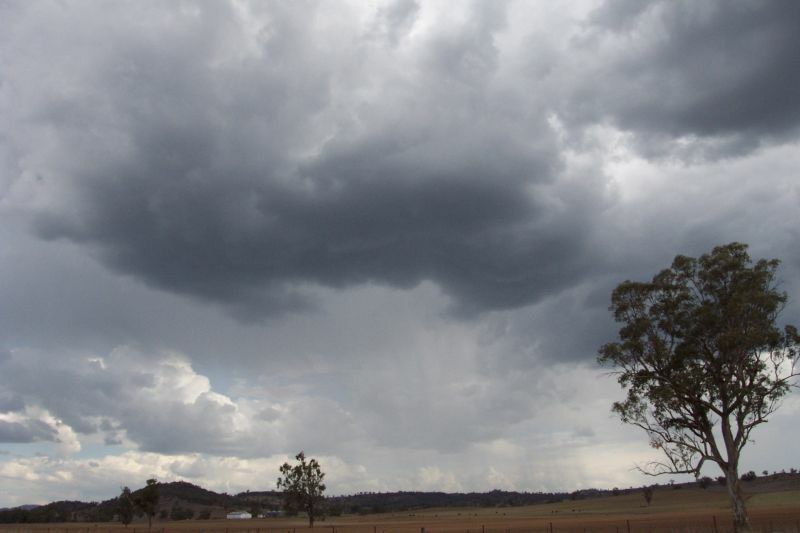 Matthew Pearce called to give an update and told us that a line of showers had formed west of us. I went to bed in hope that they might develop overnight, but they just gave us some rain when they moved over (which I slept through). Friday was looking better than today anyway! At last! We woke up to almost completely clear skies, perfect for some decent heating. Moisture wasn't a real concern today, as it had risen overnight. Cu began developing quite early, an encouraging sign! We decided to drive up to Mt. Kaputar, something that I must admit was quite excited about doing! 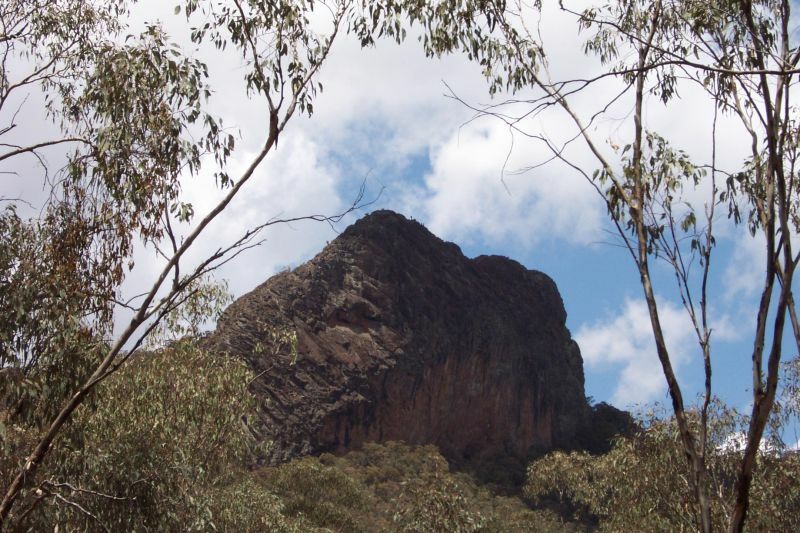 I love bushwalking (or in this case, driving!). We thought It'd be nice to do, and we might also see some developing storms. The temp had dropped quite a bit by the time we reached the top (1510m), and the view was magic!! We could see for quite a ways, and it was pretty cool being up close and personal with a nice Cj!! 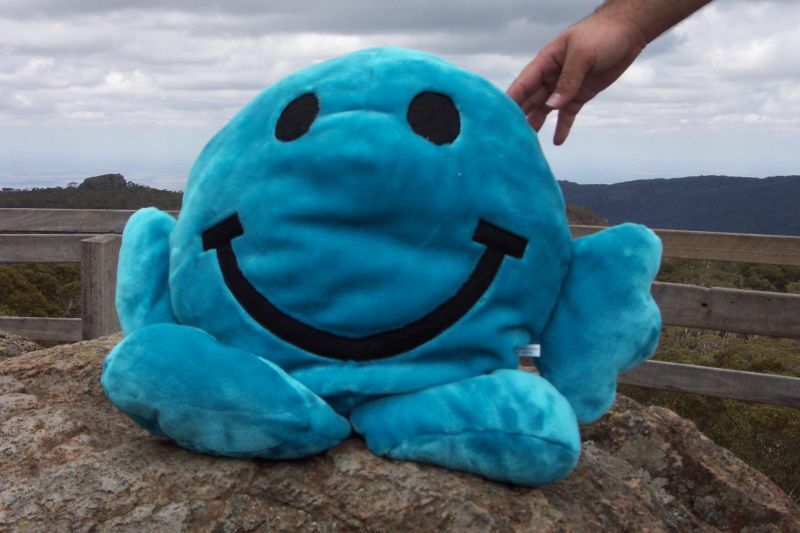 We also took Mr. Mookey (the always optimistic storm chaser) to the summit, and he was quite happy about it, as usual! After enjoying the view for sometime, we headed down, as development was starting to kick off. When we got to Narrabri, some very nice congestus had formed, so we quickly grabbed some KFC to fill us up, and headed south to the outskirts of town to decide what to do. 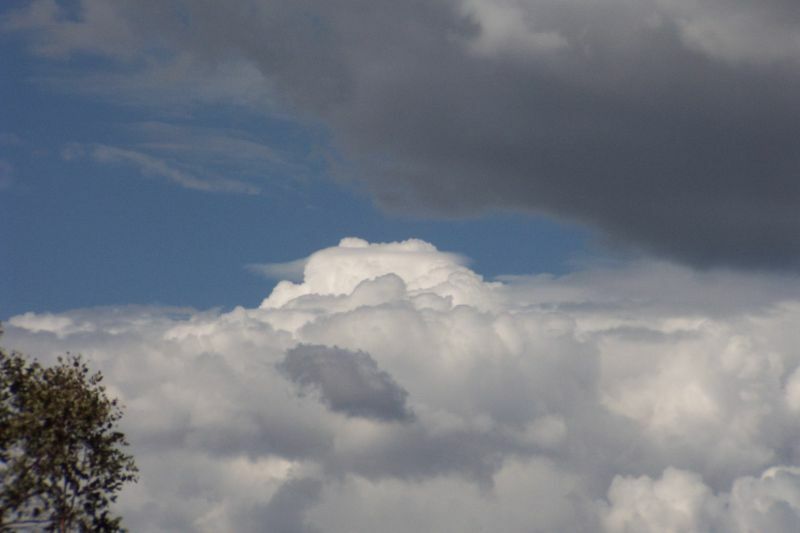 When we got there, quite a lot of pileus was forming on the congestus over the Kaputar National Park to the east. It was at this point that we had to split. After quite a bit of travelling, dad didn't want to head south any further, so we headed NE to catch the activity E and NE of us, while Anthony and James headed south to catch the developing stuff down there, and meet up with Clyve Herbert. As we got closer to the activity on the ranges, it began to look unimpressive, and we only got a little bit of rain from it. 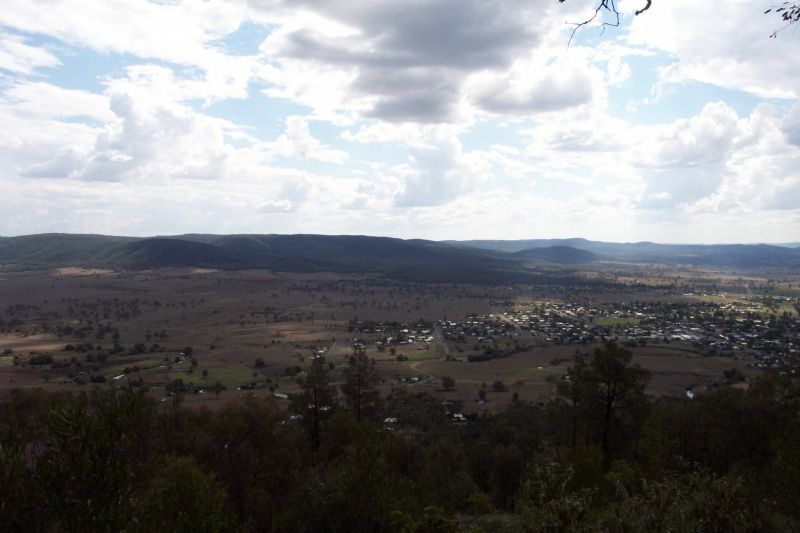 We continued to head towards a town called Bingara. On the way there were still some nice Cjs going up on the ranges. 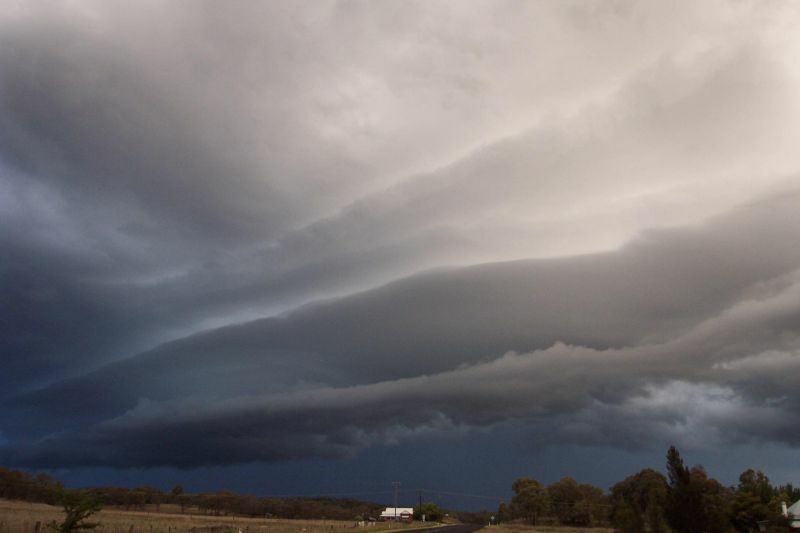 At Bingara we gave Michael a call (around 3pm) and he suggested to wait there and catch the activity coming from the SW (storms were all moving NE today). 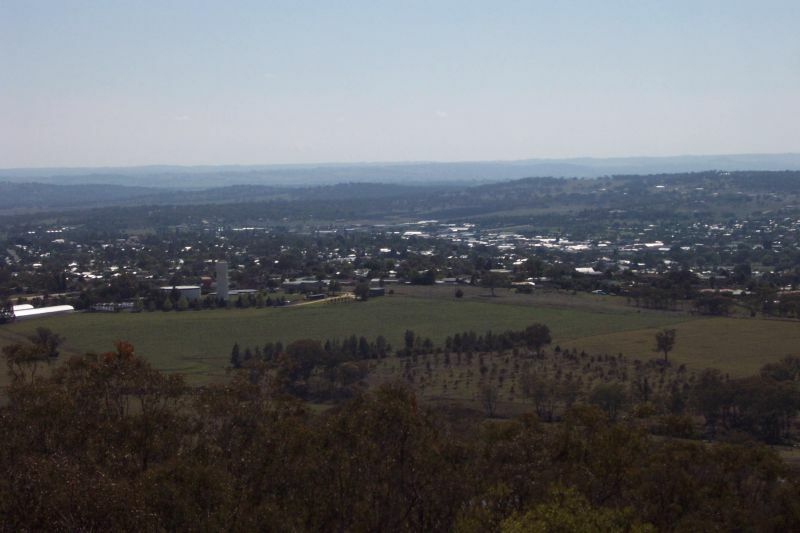 So we grabbed a bit of afternoon tea and then headed to the Bingara lookout (doesn't every town seem to have a lookout??). 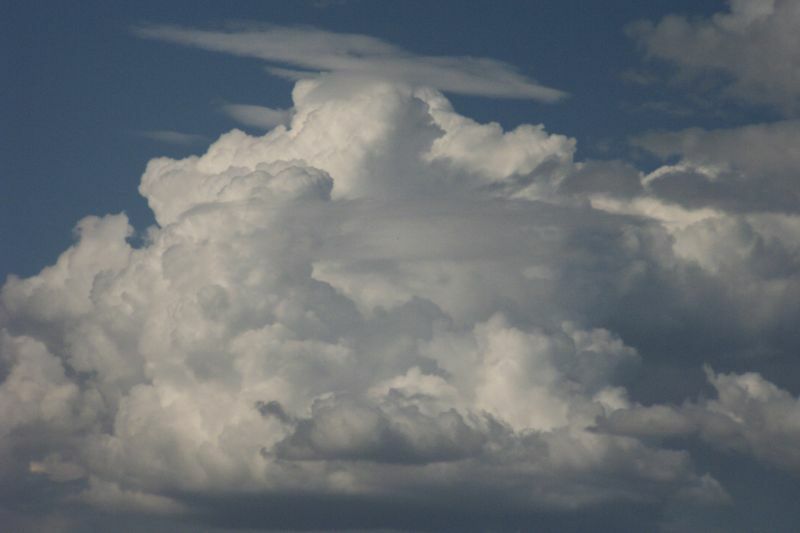 The view to the N round to the W was good, but now it seemed that the best CJs with pileus were forming east of us. We watched for a while, and nothing stood out until around 4pm. To the SW, congestus seemed to explode a bit more, so we decided to take a very 'around the way' road to Inverell, that went south via Copeton Dam down to Bundarra then north to Inverell. What a great decision!! We saw some beautiful, high contrast congestus, that looked really cool!!! 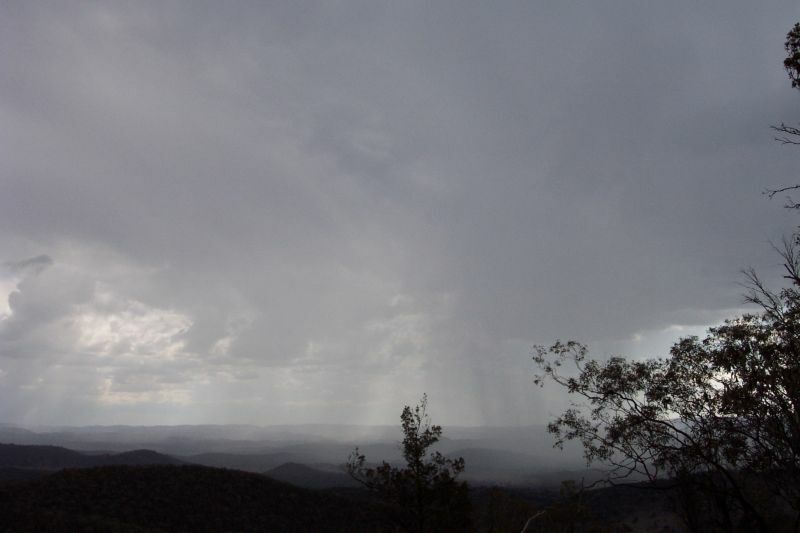 And a small cell developed nearby to the SW, which we watched move over the valley from a lookout near Copeton dam. By the time we reached the dam (we were still just in front of the cell) it was putting out CGs with nice loud cracks!! It seemed like cells had now developed in all directions! 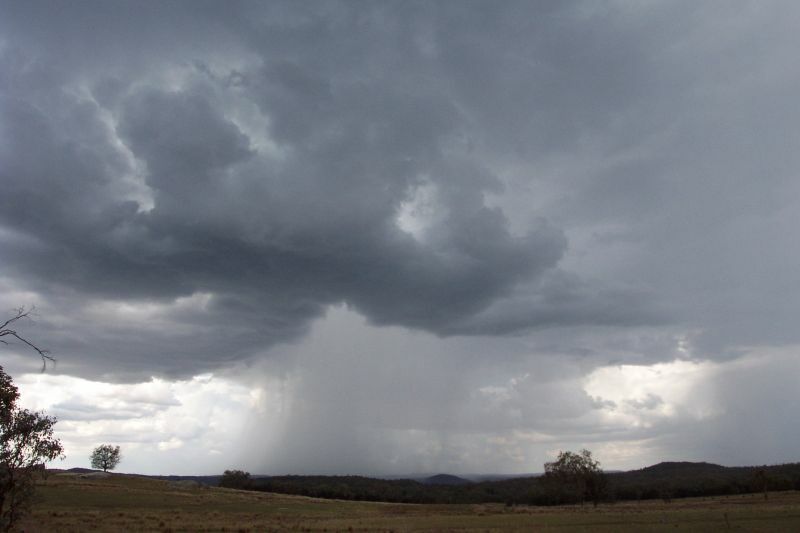 After driving through the heavy rain from that cell we continued in a SE direction to Bundarra. Just out of the rain we saw an echidna crossing the road!!! I was so excited and jumped out with the camera to video it (I got right up next to it when it curled into a ball). But stupid me hit the record button by accident, so when I went to record it, I turned the camera off! So I have quite a bit of footage of my feet when I jumped back in the car, and no echidna! We stopped every now and then to take photos/video of cells everywhere, and at one stop, encountered two bulls having a full on brawl!! It was quite funny, but we had to jump in the car and continue on the chase. 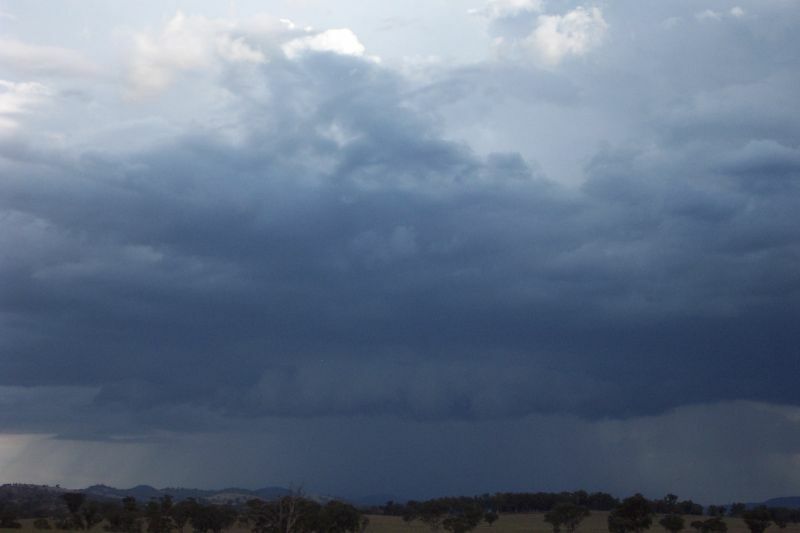 At around 5.30pm we came into a clearing and noticed a very heavy shower SW of us, maybe about 50km away. It had quite a bit of scud around it's edges, so we stopped to watch. Lucky we did, as it quickly developed a guster, and began to spread a lovely crisp anvil (I could only see the side as cloud blocked the view above me). I hadn't seen such a well defined anvil in ages! A line of congestus also extended into the cell, which is always a good sign! It was very slow moving though, so we watched and waited for quite sometime. 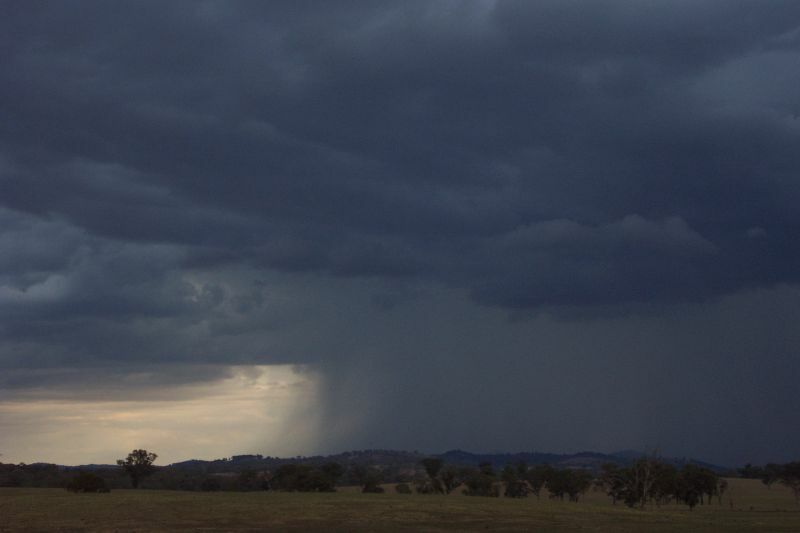 The rainshaft was so dark it was amazing! We had a really nice farmer come out to ask what we were doing and said 'that's the sort of cloud every farmer wants to see'. I was amazed at how positive he was, even with the drought so bad in that area. He said 'even if we miss out today, our turn will come soon'. He stayed and chatted for a while, quite interested in what we were doing. 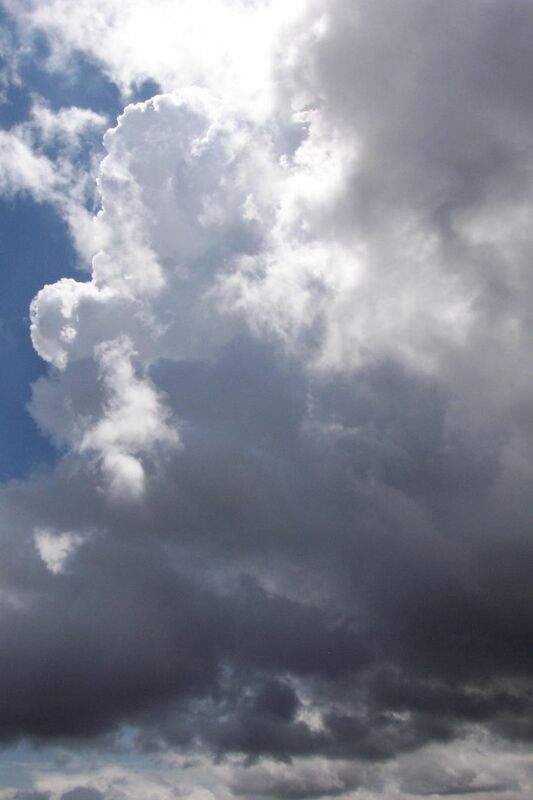 I was taking some time lapse of the developing storm too which hopefully will turn out good. The guster soon weakened around 6pm, and the number of CGs dropped (which had been quite good earlier). The rain slowly made it's way over, and we noticed some nice rain free bases to the NW of us that seemed to be in line with the cell that was just SW of us. Just as we took off south to head into the rain, the cell NW of us began dumping down rain, and dropping numerous CGs!!! I was a little disappointed as I thought it would get away from us, so I just enjoyed the heavy rain we were driving through. We were at Bundarra very quickly, and the road began to head NE......perfect!! One thing you've gotta love about low shear environments is the way that storms are easily catchable. The cell that had been NW of us was now almost straight ahead, so we just went into the back end of it. 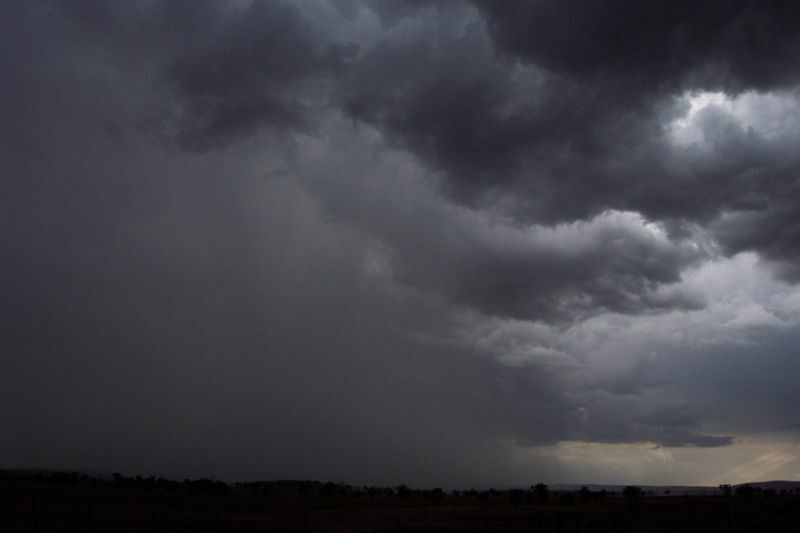 We got some very heavy rain which again was quite enjoyable, and soon we came out to the front of the storm. We were ahead of it for a little while before I caught a glimpse of something quite interesting through a gap in the trees. At the next gap I told dad to pull over and low and behold, there was a guster!!!!!! The one thing I had been desperate to see the whole trip was finally in front of me!! It was quite photogenic too, with some nice colours due to the lowering sun! We kept ahead of it, which wasn't hard considering it's speed. Every so often we'd stop where there was a gap in the trees (this was certainly a bad storm chasing road). 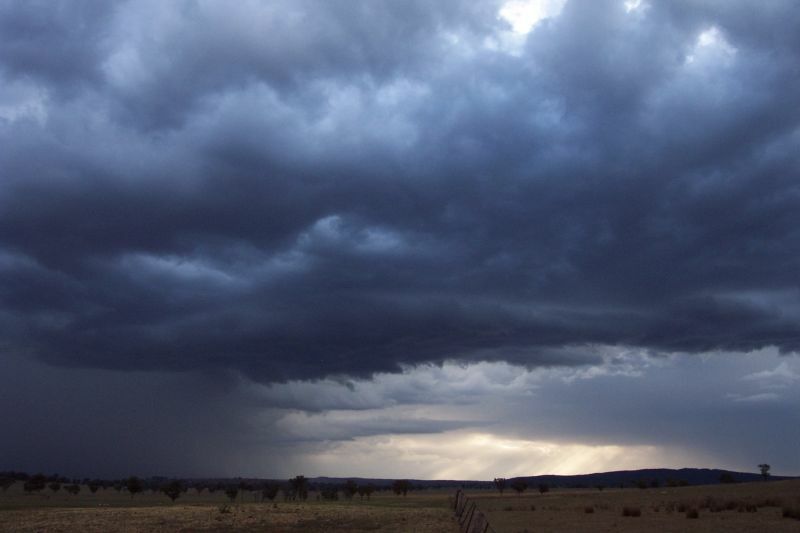 The storm was now quite weak, with not much rain underneath it, and no thunder or lightning seen. Still, the guster continued to change, and still looked quite nice! One thing I really loved about the guster were the bandings in it, one of which let a line of bright light through just above the dark bottom of the guster. It certainly was a sight for sore eyes! We'd travelled over 3000km and seen nothing close to this. By the time we reached the outskirts of Inverell, the guster had really lost it's best structure. We took a couple of last pics, and went and found some accommodation. We grabbed some dinner at around 8pm and went to a lookout to watch lightning in the cells north and east of us, but it was VERY infrequent. We got a flash every 5 mins! After dinner we went straight to bed, quite exhausted after all the excitement. We had come to the last day of our chase holiday, and had to be home by the afternoon. I had really wanted to stick around the region and chase, but we needed to get home. The setup was still looking ok, and the sky was completely clear. After packing the car we went back to the lookout we were at the night before to check the view, and it was quite nice up there. We enjoyed the sun, the view, and the wildlife that was all around! At around 10.30am we left. 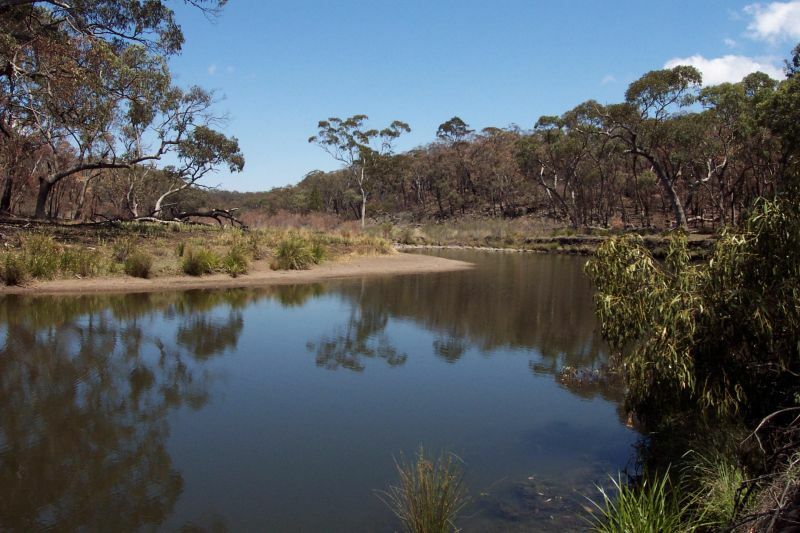 We went from Inverell to Glen Innes via Kings Plains National Park, hoping to do a quick bushwalk. 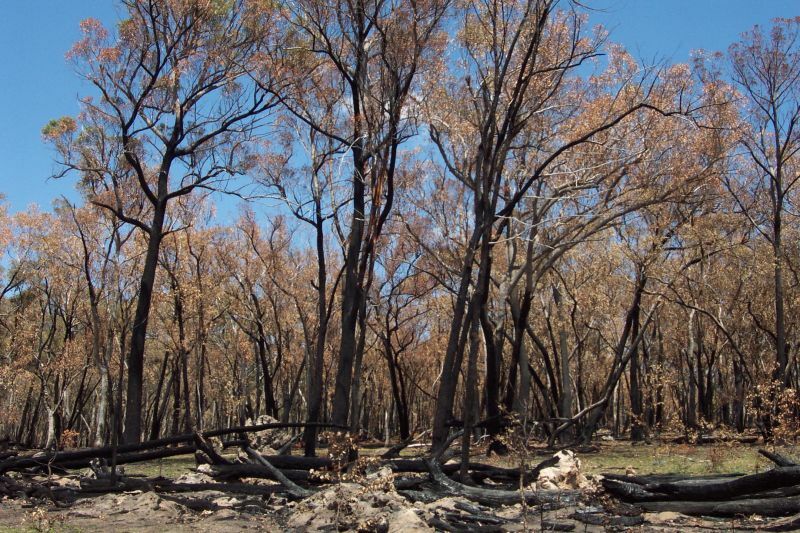 When we got there it was all burnt out from the recent fires!! We couldn't figure out the track to the waterfall (which probably wasn't flowing anyway!) 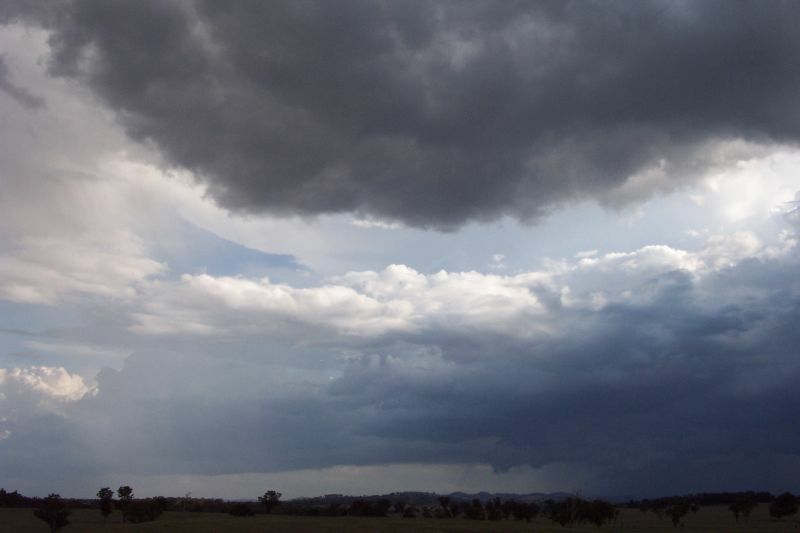 so we just headed home, going to Tenterfield, then east back to Wollongbar seeing a little bit of weak congestus on the way home, which didn't produce anything. Although skies were clear back home, it was sure nice to finally be back there again! Thunderstorm wise I don't think I could call the trip successful. 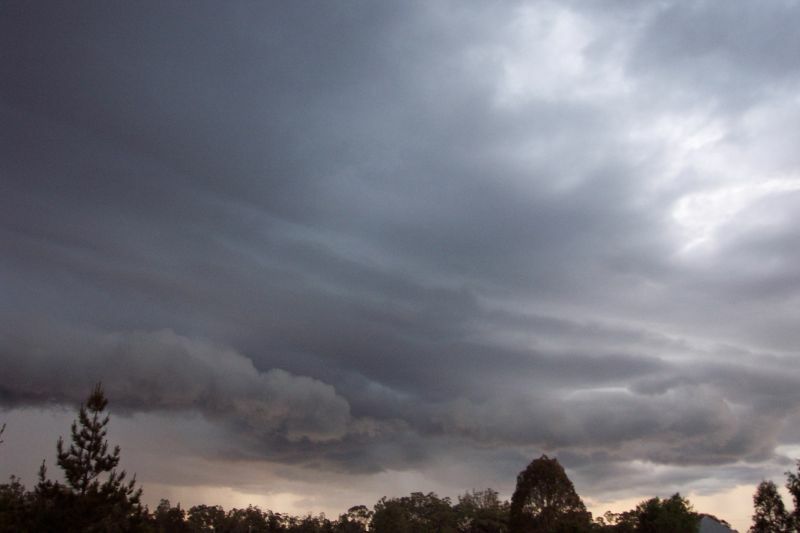 But we did get a couple of really nice storms, and saw a lot of country NSW. 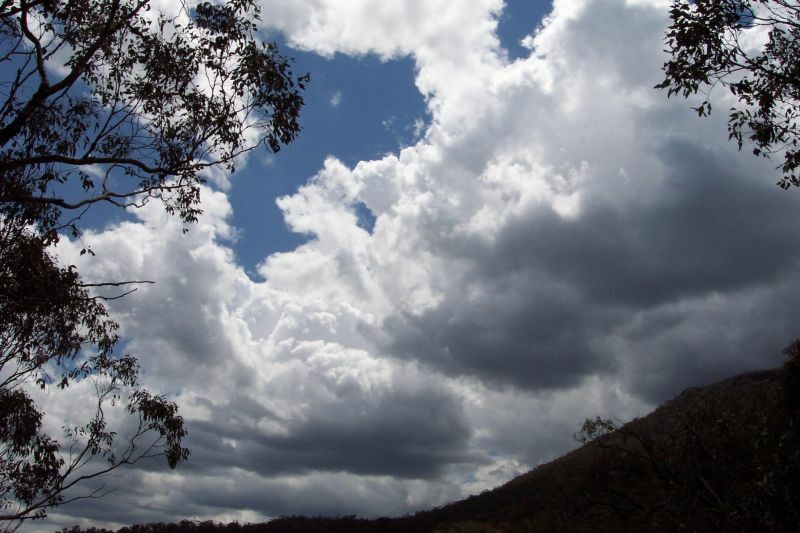 I certainly enjoyed a number of bushwalks we did, and saw plenty of different types of interesting weather. Had I had my time over, I would have headed out around 5 days later than we did (it's so hard to plan a storm chasing holiday 2 months in advance!!). Still I had a great time, and it certainly was good to get away. 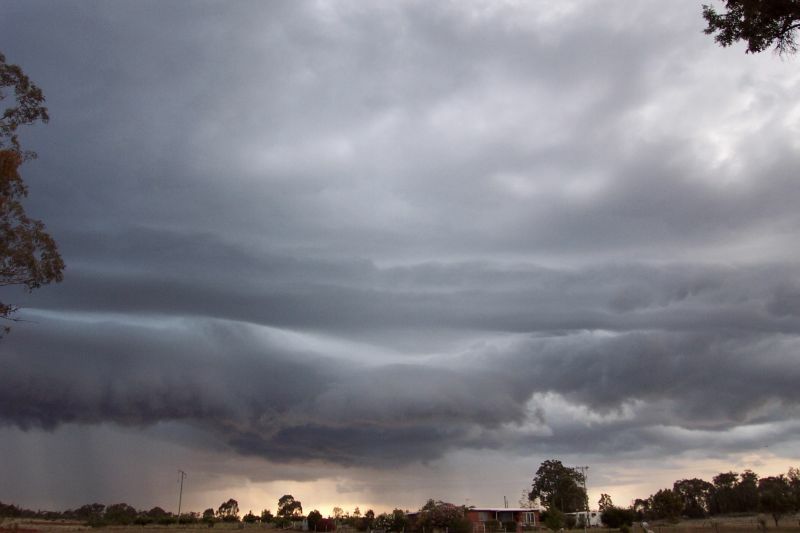 Hopefully TDU 2003 will bring us plenty of storms and supercells!